Have you guys heard about these Phat Fiber Sample Boxes? Image from Phat Fiber blog. As I understand, they are a box full of samples of yarn and/or fiber from a collection of independent fiber artists that go on sale once a month. They sell out within seconds, literally. I heard about them a couple of weeks ago and decided to try to stalk the website and snag one tonight. Unfortunately, I missed out because they went so crazy fast. I can see why, as I love the idea of being able to try a wide variety of fibery goodness before you commit to a full skein or braid. Also, the surprise factor is so fun. I really hope I’m able to catch one sometime. This month’s theme was Seaside Cottage, so it was full of lovely blues and greens. You can see some videos detailing what goes into the boxes here. The theme for August is Arabian Nights, which I predict will involve lots of bright, warm colors. You’ll see that the boxes also contain some other random goodies, including a pattern or two. I’m going to contact them to see if I can contribute a pattern for the boxes at some point in the future. Lots more info can be found in the Ravelry group. You need to sign up for the mailing list to find out when the boxes go on sale. There is also a contest thread you can enter by purchasing something from one of this month’s contributers. When you purchase something and post about it in the thread, you are entered to win a box of goodies and/or another prize, which this month is a pair of hand carders. Sounds awesome, right? So, of course I had to enter, which means–oh no!–I had to purchase some fiber. I’ll have to show you all when it arrives! What’s the craziest thing you’ve ever done for yarn/fiber? So far for me, it’s sitting at this computer hitting the refresh button like a maniac for 15 minutes or so, hoping a box will become available again when somebody changed their minds. 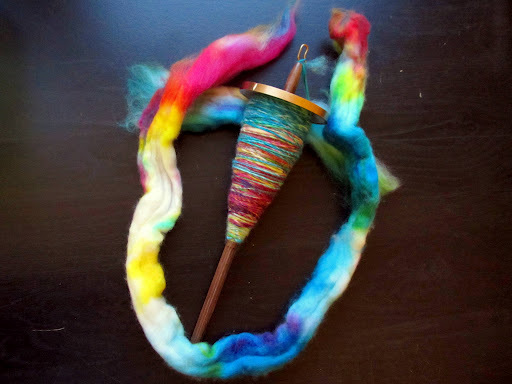 This entry was posted in blogland, spinning, yarnaholic by shoelaceswitcher. Bookmark the permalink. Sorry you didn't get your box. I heard it's crazy hard to get, but maybe someday soon! I hope when you try and submit a pattern you get in, your patterns are so lovely! I love your spinning by the way, it's such a rainbow of fun! Yay for new spinners! I started in January and have been slowly gaining momentum. It's a lot of fun. I love that fiber it is so gorgeous! I always wanted to get a phat fiber box but I always forget which Saturday it is! Seriously though, I probably missed it at some point but where did you get that gorgeous fiber? I am in love! I've tried to get one of those boxes twice and failed. At some point my boyfriend of the time managed to get me one, but he unknowingly got the yarn one, it was not worthwhile to me, I just ended up with several skeins of 10 yards which I can't figure out how to use for anything. In my opinion, only the fiber one is worth it. I love the Bugga! That is going to be one beautiful skein of handspun! I confess, I'm a Phat Fiber junkie. 🙂 I started trying for boxes last July, and I've managed to snag around 5 or so. It really is crazy how fast they go! When I'm especially in love with the month's theme, I admit to even pulling in my GF and having her try for one on her computer, too: it doesn't always work, but when it does, it's like Christmas! Also, your handspun Bugga is absolutely lovely. Such beautiful colors!! It's from Cephalopod Yarns, they also have a 50/50 merino/silk blend. Ooooh, good to know! I was aiming for a mixed one since I figured I could use the minis for a sock blanket, if they were big enough. I think the Phat Fiber boxes are such a great idea! What do you do with all your bits and bobs?